This beautiful 2244 sqft, 4 bedrooms, 2.5 bath home, built in 2002 is a vacation oasis! 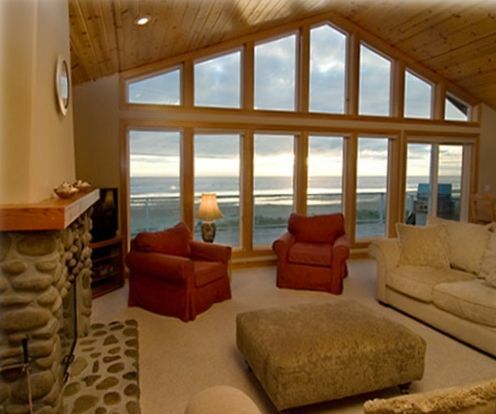 Light and airy with a spectacular view of the ocean, sunset and Neah-kah-nie Mt. This home has terrific access to the beach across the street and is just blocks from down town. This home has two levels; downstairs there is a fabulous family room with a view There are three beautifully decorated bedrooms and a full bath. The upstairs has a large open floor plan with a living room, dining area, kitchen and half bath along with a master bedroom with private bath. There is a view from just about every room in this home. Due to owner's & guests' allergies No PET Allowed. This vacation home is listed as an oceanfront property. Which mean, the ocean is in front of the home. It has a 180 degree view of the ocean from the living room, kitchen, and the deck. Additional folding chairs are stored in the master closet. Great place, spacious, wonderful location and terrific view! Clean, well-organized. Perfect for our stay with extended family. Spacious common areas, well-equipped kitchen. Loved it! Very clean, convenient and right on the beach. Will definitely be back. Spacious place with a great location on the beach and close to town. We came here with kids and my parents. There was plenty of sleeping space for everyone and room to spread out. Easy walk across the street for daily beach play and great sunset view from the deck. Also took a few walks downtown to enjoy mexican food, coffee, and wine. Wonderful view and clean home. Well supplied linens and bedding/blankets. Well equipped kitchen including glasses...water and wine. Very important. Loved the 180 degree view of the ocean from the living room of this house. Access to the beach is just couple of steps. The house is clean and comfortable. Will definitely return as time permit. Great location. Comfortable. Plenty of room. Views of the ocean are fantastic. Really enjoyed the weekend at Oceans Six! Everything was top notch. All we needed was provided. The deck looking over the beach and ocean was the best. Beds comfy. Quiet at night. Manzanita a charming place with excellent bakeries.